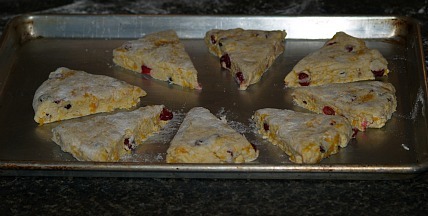 Learn how to make cranberry scones recipe. It is the perfect way to start off your holiday breakfast or it makes a great addition to a holiday buffet table. Scones are popular in many countries, especially Britain, the United States, Canada, New Zealand, Ireland and Australia. 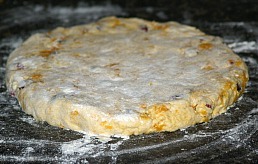 The scones were originally made in a large round flat cake (size of 8 inch cake) and baked on a griddle. Then it was cut into triangles when serving. When baking powder became available, the light fluffy scones that we know today began being baked in the oven. These lightly sweetened baking powder recipes being made today can be found in a variety of shapes such as rounds, triangles and squares. 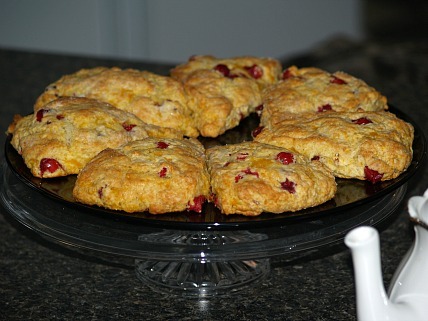 When you learn how to make cranberry scones recipe you will find they fit in perfectly for the holiday season even making a great holiday gift recipe. Scones were already familiar to the early settlers of this new world. From the American Indians the learned the valuable information of cooking and eating cranberries. When combining these two together it simply made a wonderful combination making for some of their very best baking. As you are learning how to make cranberry scones recipes you will see that today many other ingredients are added to please various taste buds. Cinnamon is an ingredient found in many different types of scones and the flavor of orange blends quite well with cranberries. The first recipe for delicious fluffy buttermilk scones is filled with cranberries; they are special enough for a Thanksgiving recipe or a Christmas recipe. Like all cranberry recipes they are delicious and make a very pretty presentation. Use all purpose flour unless recipe instructs differently. Use very cold butter; cut in with pastry cutter until crumbly (pea size lumps). Mix wet ingredients with dry ingredients only until moistened. When kneading handle dough as little as possible. Gently roll or pat dough into 8 inch circle and cut into 8 wedges (unless you are cutting in shapes with cutters). Scones are best eaten when hot or warm. Combine the flour, 1/3 cup sugar, baking powder, salt and baking soda in a large bowl. Cut in the butter with a pastry cutter until crumbly. Stir in the buttermilk just until blended. Fold in the cranberries and orange peel. Turn dough onto a floured board and divide into half. Shape each half into a ball and pat into a circle. Place on a lightly greased baking sheet and brush with milk. Combine the cinnamon with the remaining sugar and sprinkle over the scones. Bake for 15 to 20 minutes or until golden brown. Combine flour, sugar, baking powder, salt and cloves; cut butter in until crumbly. Reserve 1 tablespoon of the whipping cream. Add remaining cream and cranberries to flour mixture stirring just until moistened. Turn dough out onto a lightly floured surface; knead 5 to 6 times. Shape into 8 inch circle; cut in 8 wedges and place on lightly greased baking sheet. Prick tops with fork 3 or 4 times; brush with reserved cream. Bake 18 minutes or until lightly browned. Drain oranges and press between paper towels to remove excess moisture; set aside. Combine flour, baking powder, soda, salt, 2 tablespoons sugar and orange rind in large bowl. Cut in butter until crumbly; Stir in oranges and cranberries. Add buttermilk and stir just until moistened. Turn dough onto lightly floured surface and knead about 1 minute. Pat dough into 8 inch circle; cut in wedges and place on lightly greased baking sheet.